Earlier this week, several cosplayers, actors, and comic creators gathered in Hollywood’s TCL Chinese Theatre for Excelsior! A Celebration of the Amazing, Fantastic, Incredible & Uncanny Life of Stan Lee. Hosted by master of ceremonies Kevin Smith, the event featured a number of representatives from the entertainment industry sharing stories and paying tribute to the fallen Generalissimo nearly three months after his passing. Among those in attendance was actor Wesley Snipes, who dabbled in the Marvel Universe when he starred in the Blade trilogy from 1998-2004. Before appearing in those films, Snipes attempted to get a Black Panther film off the ground in the early ‘90s. While speaking with Collider, Snipes was asked if he would be up for reprising his most famous role for Marvel Studios one day. His response of “Daywalker clique, baby” isn’t a definitive yes or no. But nevertheless, his upbeat disposition seemed to indicate an openness to return as the taciturn vampire hunter. Listen to Snipes’ remarks for yourself via Twitter below. 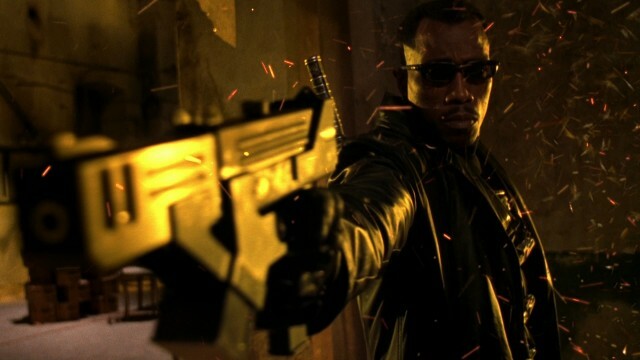 Would you like to see the actor return as Blade in a Marvel Studios film? Tell us your thoughts in the comment section!